The battle has been won, but the war goes on. The labor movement and progressives are often guilty of what has been called "official optimism." Victory is declared after every battle, no matter how far we retreat. Many have adopted an attitude of Orwellian doublethink -- simultaneously believing the hype, while knowing full well that appearances are merely being preserved. The practice of official optimism is so pervasive that we sometimes fail to recognize the importance of real victories. We are so used to constant deception that we brush off every victory declaration as just more of the same, and plunge ahead unheeding. The tentative agreement in San Francisco between hotel workers and the Multi-Employer Group (MEG) hotel bosses appears to be an exception to the rules of the "official optimism" game -- a declared victory that is the real thing. Real gains have been won for hotel workers. The agreement was announced by UNITE HERE Local 2 on Wednesday, September 13. The agreement mandates significant wage increases, including back pay. It maintains our current medical coverage without any change in eligibility or payments. It improves our pensions. There are workload reductions for the maids. It improves job security when hotels are sold, and makes it easier for the union to organize new hotels. The settlement is not without its weaknesses -- for example, the wage increases and the pension improvements could have been better spread out among hotel workers -- but more on that later. While the full agreement is not yet widely available, Local 2 president Mike Casey has declared that it contains no concessions. This victory is all-the-more remarkable in the wake of a two-year battle waged against a determined and avaricious enemy that was, and still is, set on squeezing every bit of profit possible out of our hides. This battle included a two-week strike, which became a two-month lockout, and then a two-year boycott. Notably, Local 2 has beaten back the attempt by the hotel bosses to create the kind of two-tier system that many other unions have knuckled under to in recent years. However, it ain't over yet. The agreement is with the MEG, thirteen hotels with about 4,000 workers. There are many thousands more hotel workers in San Francisco still without contracts -- both in big hotels, like the Marriott, and in many smaller hotels like the one in which this writer works. The smaller "boutique" hotel companies, like Kimpton and Joie de Vivre, have captured a good percentage of the hotel market in recent years. It remains to be seen just how the other hotel bosses will react to the terms of the MEG settlement. A battle is, after all, still only a battle, no matter how hard fought. The war on labor, like the endless "war on terror," is far from over. The Local 2 victory with the MEG hotels helps reestablish San Francisco's reputation as a union town. But how this union town supports the thousands more hotel workers still struggling for a contract, and for some measure of economic justice, will say a lot about how much this victory will be consolidated. In addition to San Francisco, other UNITE HERE hotel workers locals have settled contracts in recent days. In Chicago, agreements were announced last week with Starwood Hotels (operators here of the Westin St. Francis, the Palace, the St. Regis, the W, the Sheraton Fisherman's Wharf, and Le Meridien). Previously, agreements had been announced in Chicago with Hilton and Hyatt. Puerto Rican hotel workers at the Caribe Hilton voted to accept a new contract at the end of August. In Monterey an agreement was reached late last week with two Hyatt hotels. But, as the battle continues here in San Francisco, thousands of hotel workers are still fighting for contracts in Chicago, Puerto Rico and Monterey, as well as in other cities as far flung as Honolulu and Toronto. 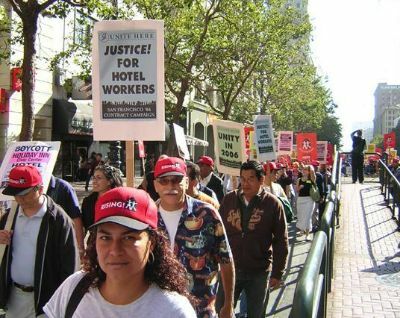 In San Jose, UNITE HERE Local 19 announced last week that nearly 300 hotel workers at the Doubletree San Jose had gained union recognition. Their battle for a contract is only beginning. On Friday, September 22, MEG hotel workers will ratify their new contract. Other San Francisco hotel workers will fight on, together with their sisters and brothers at the MEG hotels, for economic justice for all. The solution to injustice, as always, is solidarity, solidarity, solidarity. We've won a battle, but we have a war to fight.